To obtain a position utilizing my skills, experience and qualifications. Summary of Skills and Experience??? Summary of Skills: ?Proficiency in computers, word processing, basic web design, internet marketing, website content management, PC/Windows troubleshooting, MS Office, clerical work, professional writing skills, communication skills. Typing - 80 wpm. Excellent spelling, grammar and composition skills. Familiar with Associated Press writing style. Foreign languages: Chinese, Taiwanese, Russian. Summary of Experience: Four years experience creating, marketing and managing successful online businesses, and generating residual income streams from them. One year experience in professional journalistic writing. 10 years experience in organized high quality writing. Two years experience in sales, marketing and promotions. One year experience working with youth.
? During first six weeks, successfully met a tight deadline by completing the edit of a 500,000 word batch of script files, retaining both quality and speed.
? Served as travel assistant and consultant to a multi-millionaire friend who owns a highly successful online medical business, during our trip to the Philippines from Nov. 2006 to Mar. 2007. He chose me for my international travel experience, multi-cultural knowledge, communication skills, and reliability. I organized our travel, transportation and accommodation arrangements. As his apprentice, I gained a lot of knowledge about creating and marketing online businesses, which I put to use in creating my online business mentioned above.
? In charge of marketing promotional team for Owens Corning?s innovative basement finishing system at home trade shows around the Puget Sound area. Supervised teams of 2-3 per shift.
? Generated sales leads which consistently exceeded projected quotas, demonstrated products to prospective clients, answered questions, and explained features and benefits.
? Responsible for opening and closing of promotion booths, daily inventory, and promotion materials/brochures.
? Interviewed Public Relations reps of major development companies to obtain info, quotes, and press releases.
? Taught advanced level adult English classes. Courses included advanced levels 3, 4, and Business English.
? Taught English to junior high level students.
? Set up and organized the grand opening event and show for a new English self-learning center.? Designed artsy promotional flyers, brochures, posters, and orchestrated interactive activities for open house event.
? Sold yearly contracts for Cingular cell phone plans. Assessed customer needs and made suggestions.? Informed customers of available service plans, promotions, phone models/brands, technologies and features.
? Gained knowledge of major wireless phone providers such as Cingular, AT&T, Sprint, T-Mobile, Verizon, Nextel, and Qwest, to educate consumers on them.
? Met sales quotas for most months. Provided help and trouble-shooting over the phone to customers that signed up for service. Educated and demonstrated cell phone operation and features for customers.
? Provided job referral services to employers and job seekers through the Washington state employment office.? Screened resumes and job applicants. Referred qualified applicants to employers.
? Used computer to register job seekers, refer applicants, open job orders, and record department services.
? Performed clerical duties, data entry, mailing letters, inventory reports, answered phones, and transferred calls.
? Provided public assistance in Job Resource Center with use of software, job search, and resume tips.
? Scheduled and referred models and talent, in person and by phone, to auditions and casting events.
? Provided career consultation to aspiring actors and models.
? Achieved the record for most referrals generated in a day at 66. Consistently exceeded quotas and goals.
? Performed as actor and magician assistant in a Mark Twain stage show for tourists, doing elaborate stage magic and mentalism acts. Peformed three times daily ongoing through Summer and Fall seasons.
? Before each show, went onto the street to promote and round up crowds ranging between 20 - 200 for our audience. Conducted tours of historical sites to audience members afterward.
? Managed dorm of over 100 students. Coached student behavior/responsibilities.?
? Maintained files on students, handled daily paperwork and updated documents.
? Troubleshooted and repaired various computers problems on Center.
? Generated over 2000 leads as part of a promotion program which resulted in $400,000 worth of sales for 1998.
? Successfully promoted the brand image of clients such as Swiffer, Febreze, Pantene, First USA Bank, QVC, Statewide, Malt-O-Meal, Pepto-Bismol, Excedrin, Claritin, Amazon.com, and Kellogg?s through samplings, free drawings, floor demonstrations, etc.? Brought consumer awareness to thousands. Bachelors in Marketing and Computer Information Systems - California State University Hayward?????????? I would like to state that Winston Wu of Bellingham, WA worked for Estates News for about a year as a reporter. During this period he proved his journalistic skills well and did reporting work for our newspaper covering the Moscow real estate market. 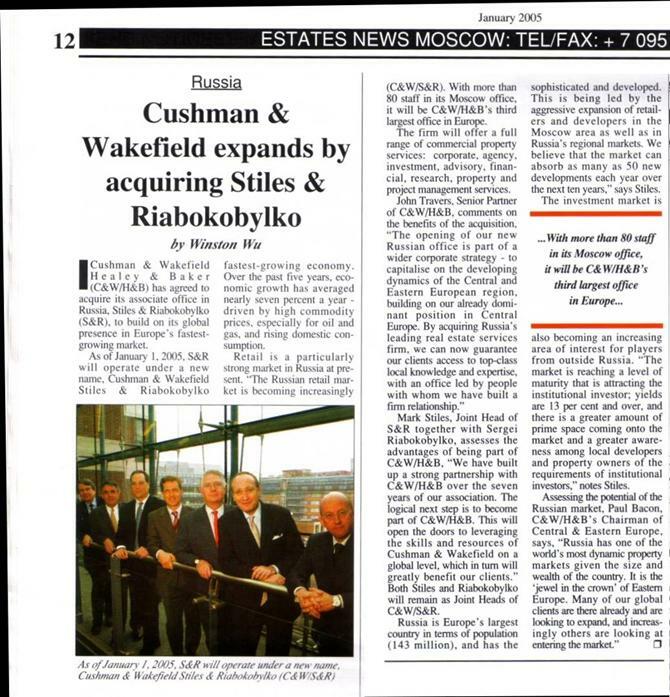 His work also involved interviewing key market players and keeping the local news desk updated on new projects coming in the market. I wish Winston all the best in his career as a journalist. 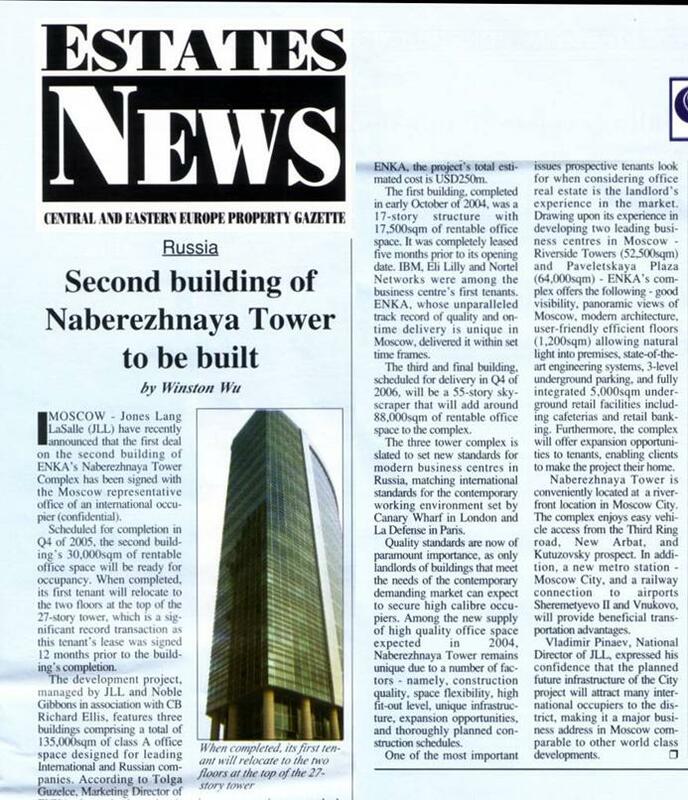 Estates News is the only English language publication wholly dedicated to the exciting emerging real estate and property markets of Central and Eastern Europe, published directly from the region itself. ? It is with great pleasure that I recommend Winston Wu. I have been reading his material since October of 2003. Winston has always displayed a high degree of integrity, responsibility, and ambition. He is definitely a leader rather than a follower. In addition to his excellent writing skills and accomplishments, Winston shows a great understanding of the cultures of the world and the way they interact with each other. His good judgment and mature outlook ensure a logical and practical approach to his endeavors. The essays on his website and the journal he has sent out concerning his time spent in Russia have let me live an experience I would not be able to enjoy. I have appreciated his intelligent writing, his honesty, and his willingness to share his joys and pitfalls with me. I have learned much about another culture and have been given insights to another nation's way of thinking. Winston would be an asset to any organization. I believe his writing skills, determination, courage, and dedication will be an asset to your staff and I am happy to give him my wholehearted endorsement. I've been receiving regular newsletters from Winston Wu for about a month now & in that time I've found his writing to be informative while at the same time inspirational. The newsletters themselves consist of information regarding Winston's travels/adventures in the Soviet Union & within the space of a month I've gone from knowing very little about this area of the world to being greatly informed. In each letter, Winston provides detailed information regarding the background of towns he's visited while traveling across this continent. This information always details local culture/customs providing me the reader with a greater insight into the Russian way of life. The writing has a certain flair to it with humour thrown subtly in & it's content has changed me from being an individual with little knowledge of the Soviet Union to one who now wants to visit this amazing country. An example of this: In one particular newsletter Winston described in great detail an underground cave system that he explored with several local Russian traveling companions. The piece was exciting & informative & while reading it I found myself visualising the caves with great ease. This talent of descriptive writing is usually only found in the work of seasoned novelists so it's refreshing to find this in creative journalistic writing such as Winstons. In short I believe that Winston Wu could easily turn this ability to any subject he chose to write about making him an exciting prospect in the world of creative media. You asked for recommendation. Here you are. I'm not very good at description, but hope it'll help you. I'm not very long on Winston's list, but read quite a few of his articles. I must say he has a wonderful stile of writing. His articles are funny, witty, easy to understand, full of interesting and useful information. According to the articles I've read by now he has a vivid talent in journalism and I think it is really the thing he's great at. I know him not only by e-mail, but also in person. I can say he's reliable, friendly, kind, active, communicative, is able to achieve everything he wants to. A spiritual experience in a spiritual atmosphere is how I would describe the Teahouse located on the first floor in the Chiayi branch of Fo Guang Shan, a famous reputable Buddhist organization headquartered in Kaoshiung. Great for vegetarians and non-vegetarians alike, this place has a tranquil glowing atmosphere, spiritual music playing in the background, and an environment so clean and spotless that you would think you were in Japan. Outside the window is a lighted waterfall that adds to the serenity. The beauty of this place is best experienced at night. The food is appetizing, healthy, and also very inexpensive. Some of the items on the menu include vegetarian beef noodle soup (NT$50), curry rice and vegetables (NT$50), and fried rice covered with tasty cheese (NT$50), all in plentiful portions. In addition, next to the teahouse is an attractive art gallery you can stroll through which makes a great post-dinner or pre-dinner walk. Admission is free of course. There are also gift shops which sell Buddhist books, music, and souvenirs. In the building on various floors are art classes, dance classes, music classes and English readers? clubs. If interested, inquire within. At the top floor is a large auditorium where talent shows are occasionally held. All in all, it is definitely worth a visit if you?re passing through Chiayi. It?s a great refuge from the hustle and bustle of the city life there. The Fo Guan San Teahouse is open everyday from 11am to 9pm, and is located inside the building named ?Fo Guang Shan Nan Hua Educational Hall? on 241 Boai Road, right next to the rear entrance of the Chiayi train station. 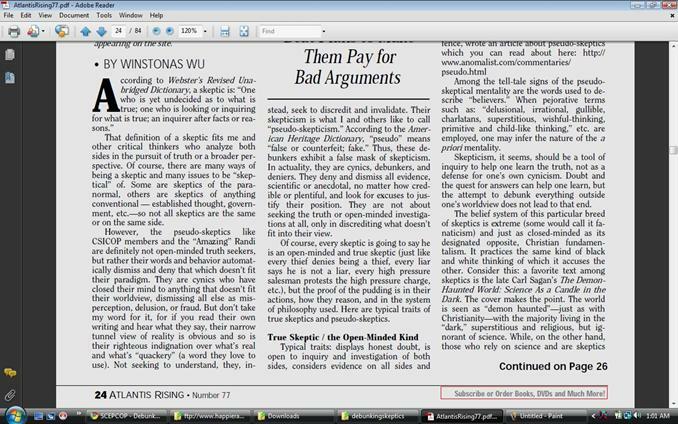 Paul Sandoval?s Rebuttal ?A logical analysis of Winston Wu's anti-skeptic article? Here are references, comments and citations about this noteworthy work of mine at these links and forum threads below:? Many of these interviews are archived or linked from this page: http://www.debunkingskeptics.com/interviews.php?? The paranormal magazine Atlantis Rising did an article about me and SCEPCOP in their Sept 2009 issue. You can see it within this Portfolio here. It is no secret that many scientists are becoming disenchanted with skeptics groups and the skeptical paradigm in general. 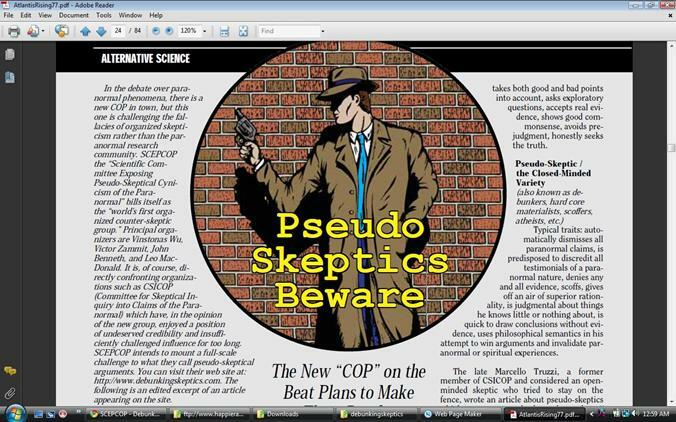 Skeptics groups have been losing membership, and some institutions now take a dim view of membership in groups like CSICOP, the Committee for Scientific Investigation of Claims of the Paranormal. This is because of a growing concern that skeptics groups and publications are interfering with the progress of science by attempting to compel the rejection of evidence that does not fit existing models of reality. Institutionalized skepticism is beginning to appear more like a religious practice, far removed from the ideals of scientific objectivity which inspired founders such as Dr. Carl Sagan. Winston Wu has now written an essay that brilliantly and decisively rebuts the general skeptical arguments against the paranormal. This is among the best essays ever written on this subject, and deserves extensive study. The essay carefully moves through the entire skeptical lexicon of arguments, rebutting each in turn. As it reveals the fallacy in each argument, it builds a crucial case against the whole skeptical approach to reality, suggesting that it is, essentially, a form of superstition that has the effect of filtering out data if it cannot be explained by accepted scientific theory. The essay suggests that a clear-eyed view of evidence is essential, and that it is lacking both among believers and skeptics. Essentially, Mr. Wu is asserting that the evidence is undigested by science as a result of its being too uncritically embraced by believers and rejected by skeptics. Mr. Wu identifies a difference between healthy skepticism and the cynicism of blanket rejection of evidence. To read Mr. Wu's essay, click here. Also visit Mr. Wu's contra-skeptic website at DebunkingSkeptics.com and participate in the counterskeptic group, SCEPCOP. A brilliant essay by researcher Winston Wu, rebutting skeptical arguments against the paranormal, reflects a growing awareness among members of the scientific community that there is something more occurring with the human experience than was once thought. The Wu essay, Strieber writes, expresses "a growing concern that the present skeptical leadership is drifting into the fallacy of rejecting all evidence that is not explained by current scientific models." He said this is "particularly worrisome now that a radical new model of reality appears to be emerging." This is the stuff the old science fiction writers once dreamed. Rather than being objective in their analysis of the data surrounding paranormal events, the skeptics seem to have formed "a superstition that has the effect of filtering out data if it cannot be explained by accepted scientific theory," Strieber said. He suggests that the skeptical paradigm has gone so far as to assume the appearance of a religion, and fails to conform to the ideals of scientific objectivity. How refreshing it is to find writers by Winston Wu (whose paper is offered on the World Wide Web rather than the controlled print media) receiving this kind of recognition and praise for their work. While I am enough of a realist to know that it is only a matter of time before this free exchange of ideas and information will be blocked, we are fortunate to be living in this last brief moment of awakening. It is a time when human consciousness has a last-ditch chance to emerge from the yoke of a tunnel reality established at least a century ago, when people bought the premise that science would solve all of the problems of the world. But even Einstein did not foresee the complexities of quantum physics, which brings forth contemporary probabilities of time travel, parallel universes, energy from antimatter, and human teleportation from one point to another. But the brave new world we face will be even stranger than most people dare to dream. We can foresee an evolved human, perhaps a human soul attached to a cyborg body and computerized brain. We receive our energy from the Sun and Earth, speak through mental telepathy, and move mountains by mere thought. It will be a world of magic and wonder. Such a world is not only possible, it may be necessary if we expect to survive the planet changes that loom. Our wanton destruction of Eden, that perfect world with a balanced ecology that provided warmth, food, water and a perfect environment for propagation of the species, is already causing alarm. Most of us will live to see a time when billions will perish and survivors are forced to live underground just to escape the destructive rays of an angry sun. Those who emerge to live on the surface of our planet must be changed if they expect to stay alive. This means either a natural form of evolution or the creation of a new and stronger type of body that will stand up under a constant assault from the sun, radical weather and a radiated soil that will not produce food. That people are currently waking to natural psychic abilities is frightening organized religion, which is quickly being exposed as the enslaving scam it has always been. Thus the wars are not going to be just between people of various belief systems, but against the psychics, who expose graft and fraud, communicate with aliens, speak with the dead, and grieve over the agony of our dying planet. Yet science, using the natural rules established for proper scientific evaluation, cannot explain the woman who speaks to the dead on an ouiji board, the magician who uses his mind and natural Earth energies to move objects, alter events and change the weather, or the remote viewer who draws pictures of secret things with perfect accuracy. That it might be possible to travel into the past and alter specific events, thus changing the tragic course of history, is not impossible to imagine. Thus the writings I have frequently submitted here, the predictions of a dying world, the destruction of billions of humans, and the great apocalyptic wars, may not happen at all. It is possible that our future is much different than anyone now imagines. I believe the secret is in shedding what contemporary author Robert Anton Wilson so aptly calls our "tunnel realities," and then learning to open our magical third eye so that we might see the whole picture. The magic is possible. But alas, the probability that enough of us will awaken in time, however, is almost non-existent. We march in lock step behind blind leaders, not realizing that they are lemmings. 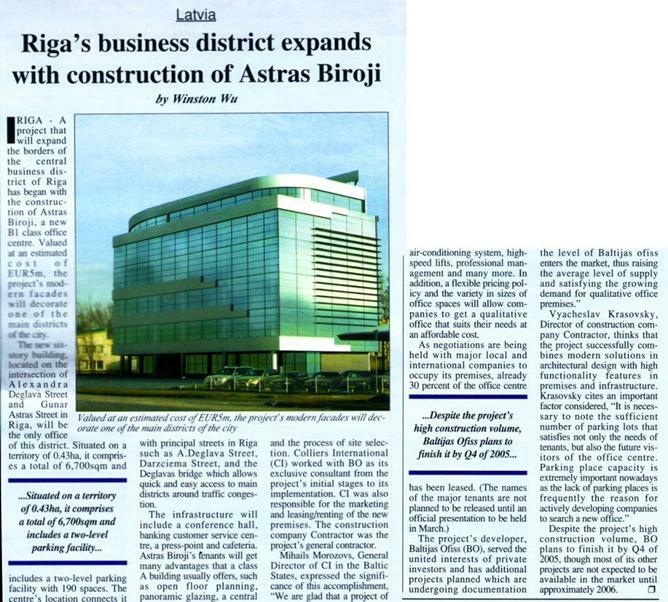 Scanned copies of my story featured in the Lithuanian magazine Antra Puse (May 2005 issue) are below.? For larger view, see the links above each image. Гражданина США ограбили накануне в Череповце. Молодые люди отобрали у иностранца видеокамеру и фотоаппарат. Милиционеры рассказали, что 30-летний американец приехал в город металлургов в гости к своим друзьям. Около десяти вечера он вышел на улицу, чтобы найти интернет-кафе. Иностранец спросил дорогу у проходящих мимо молодых людей. Те завели его за угол, избили и отобрали аппаратуру. Американец не растерялся и сразу же обратился в милицию. Грабителей задержали. Однако обвинение предъявлено только одному из них ? 17-летнему юноше. Остальные оказались только свидетелями ограбления.